The idea that smoking less will reduce smoking related respiratory infections isn’t new, but the concept of smokers switching to vaping have been a contentious point among the scientific community. Previous studies have shown us that rats or single cells can be damaged by vaping, but up until now legitimate research on human subjects have been lacking. If we were to swallow some of the previous “science” that’s been published, we may believe that vaping would cause cervical cancer in men and that it will be responsible for a generation of nicotine addicted mutant psychopaths hell bent on destroying the world (direct dig at the flat earth society otherwise known as the FDA and it’s minions). As it happens, there is still such a thing as sanity left on our little planet, as well as scientists who are actually looking for the truth, rather than their next grant check. 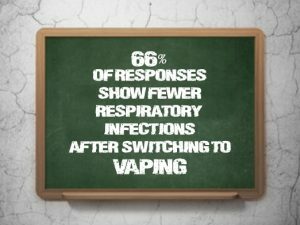 An online survey with 941 respondents was recently published in the Journal of Addiction Research & Therapy, which shows that 66% of those questioned reported an improvement in respiratory symptoms after switching to vapor products, while 5% say that they worsened, and 29% reporting no change. Professor Peter Hajek, senior author from Queen Mary University of Londons Wolfson Institute of Preventive Medicine stated that these results need to be approached with caution as they are self reported and further more detailed testing is required but it provides good information that suggests vaping does not increase infection rates in smokers. Other studies conducted in the past, such as rat testing and single cell tests showed different results but were performed poorly and didn’t use realistic exposure levels where as human trials thus far have reported no significant rises in infection levels for people who have vaped for as long as 1.5 years. The researchers did note that they expected to see an improvement in lung function for the simple fact that these people are no longer causing damage to their lungs with cigarette smoke which in itself is a positive step, but they are curious to see if the Propylene Glycol found in most e-liquids provides additional anti-microbial protection. This theory has been thrown around in the past, both by the vaping community and a few researchers, but further evidence is going to be required before anyone makes solid claims. If you remember the claims that vaping may cause pneumonia, strep, staph and the flu, if they can confirm this point all of those myths will be permanently laid to rest. Other sources have claimed that this report also shows a dramatic improvement in the lung function of asthmatics who switch from smoking to vaping and in the same light as every other participant, those with asthma did report a decrease in lung problems. This does not make vaping a magic cure-all for asthmatics but it does make it a thousand times better for their lungs than lighting up a cigarette. While American health organizations are burying their heads in the sand and positive research at the bottom of the pile, Professor Hajek and his colleagues will keep pushing forward to find the truth about vaping and for that, we thank them.